The Travelers Companies, Inc., through its subsidiaries, provides a range of commercial and personal property, and casualty insurance products and services to businesses, government units, associations, and individuals in the United states and internationally. The company operates through three segments: Business and International Insurance, Bond & Specialty Insurance, and Personal Insurance. The company is a dividend achiever, which has increased distributions for 13 years in a row. Back in April 2017 the Board of Directors approved a 7.50% increase in the quarterly dividend to 72 cents/share. The largest competitors for Traveler’s Companies include Allstate (ALL), Progressive Corp (PGR) and Cincinnati Financial (CINF). Over the past decade, this dividend growth stock has delivered an annualized total return of 8.60% to its shareholders. The company has managed to deliver a 5.80% average increase in annual EPS over the past decade. Travelers Companies is expected to earn $9.24 per share in 2017 and $9.81 per share in 2018. In comparison, the company earned $10.36/share in 2016. 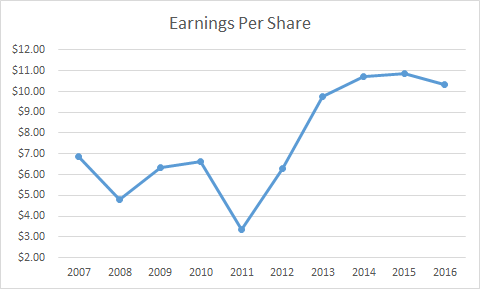 Year to year earnings are generally lumpy for insurers, as you may have years where nothing major happens, followed by an year where a lot of claims are due. An important factor for evaluating insurer profitability is the combined ratio. The combined ratio is calculated by taking the sum of incurred losses and expenses and then dividing them by earned premium. The ratio is typically expressed as a percentage. A ratio below 100% is what we are after, as it indicates that the company is making underwriting profit. On the other hand, a ratio above 100% is not good, since it means that the company is paying out more money in claims that it is receiving from premiums. Traveler’s has managed to earn an underwriting profit in nine out of the past ten years. This is very good, because it indicates that management has strict underwriting policies, and looks only to underwrite policies that are lucrative. Most insurance contracts are commodities, and the cost of goods sold are unknown at the time of underwriting. Competition is intense in commodity type industries. The risk with insurers is that management will pursue business at all costs, without looking for an underwriting profits, in an effort to generate the highest premium amounts to be invested in income producing investments. The strong underwriting record for Traveler’s shows that this is not the case, and shows that they have a disciplined approach to writing insurance policies. The other component of net income is investment income. Traveler’s has most of its premiums invested in fixed income instruments. Net investment income from fixed maturity investments has been on the decline over the past decade. It fell from $3.7 billion in 2007 to $2.3 billion in 2016. The decrease primarily resulted from lower long-term reinvestment rates available in the market. The average yield was 5.10% in 2007, and it fell to 3.30% in 2016, while average investment assets declined from $73.8 billion in 2007 to $70.2 billion in 2016. Rising interest rates will be a net benefit to insurers such as Traveler’s Companies, since they will result in much higher investment incomes. The company’s net income declined from $4.2 billion it earned in 2006 to $3 billion in 2016, while earnings per share increased from $5.91/share to $10.36/share during the same time period. This was possible due to consistent share buybacks by the company. It managed to reduce the number of shares outstanding from a high of 678 million shares in 2006 to a low of 288 million shares in 2016. A history of consistent share repurchases is helpful, because it shows that the company is willing to help out long-term holders of stock with increased proportional share of earnings and the business over time. If Traveler’s can manage to consistently repurchase half of its shares outstanding every decade, it could theoretically double earnings per share in perpetuity, even if net income is flat. 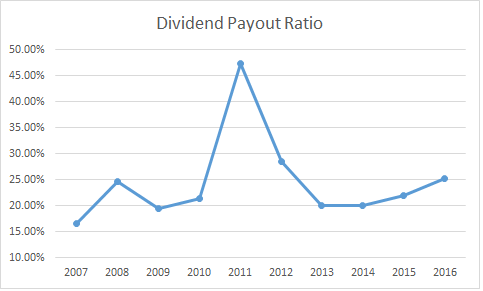 The annual dividend payment has increased at a rate of 10% per year over the past decade, which is much higher than the growth in EPS. 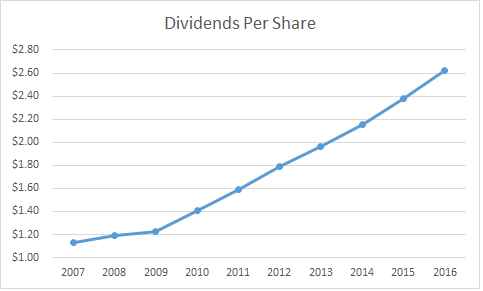 A 10% growth in distributions translates into the dividend payment doubling every seven years on average. If we check the dividend history, going as far back as 1993, we could see that Traveler’s has actually managed to double dividends every twelve years on average. In the past decade, the dividend payout ratio increased from 16.50% in 2007 to a little under 25.30% in 2016. This is a low payout ratio. I generally do not want to see high dividend growth as a result of expansion in the payout ratio. Given that the ration is so low however, I believe that the dividend is very well covered. A lower payout is always a plus, since it leaves room for consistent dividend growth minimizing the impact of short-term fluctuations in earnings. Currently, the stock is attractively valued at 13.30 times forward earnings and yields 2.30%. I recently initiated a small position in the company, because I like the valuation. In general, the insurer has sold mostly at a P/E range between 9 and 12 over the past decade, with some deviations from the norm. I would be interested in the company on even lower entry prices of course, as lower valuations increase future expected returns and dividend incomes. I do not like the fact that net income has declined over the past decade, nor do I like the fact that revenues have also decreased slightly as well. However, I do like the fact that the company generates a lot of excess cashflows that it could send back to shareholders in the form of dividends and share buybacks. I would personally prefer a special dividend over share buybacks, but I will take what I can. At this rate of share buybacks, I would expect earnings per share to double every 10 – 12 years, even if net income is flat. Repurchasing stock can work wonders for remaining shareholders, when shares are repurchased at a low valuation ( which has been the case for Traveler’s) I like the discipline in underwriting for this business, and I believe that potentially rising interest rates could be a tailwind to earnings per share. - Should Dividend Investors Worry About Rising Interest Rates?